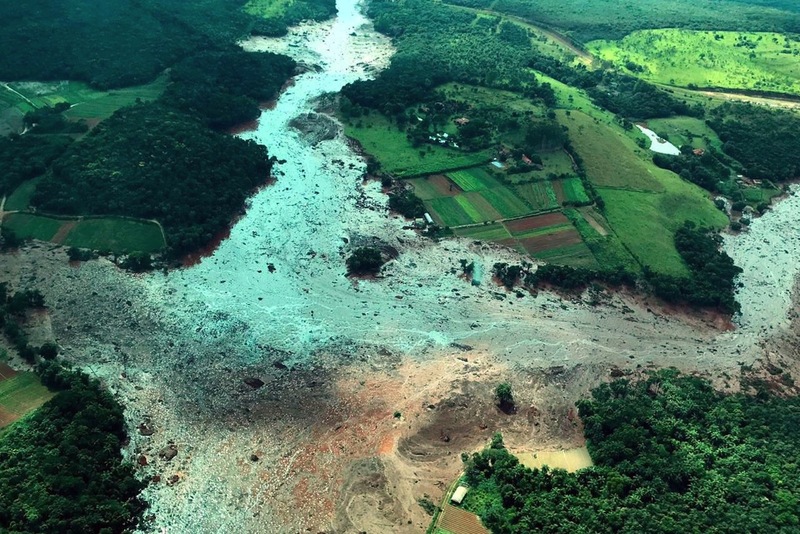 Minutes after the dam burst in Brumadinho, a river of mud swept over iron giant Vale's administrative center and restaurant. RIO DE JANEIRO, BRAZIL – A little over three years after the worst environmental disaster registered in Brazil, another dam has broken in the state of Minas Gerais, leaving at least ten dead and hundreds still missing as thousands of tons of mud swept over the town of Brumadinho. The Feijão dam burst wiping out part of Brumadinho, Minas Gerais, photo courtesy of Presidency. “When I heard that that the dam had broken I had thought that it was a test, but in less than minute…in thirty seconds it all came down. Lots of people are dead. In just seconds,” said one Vale employee in a WhatsApp recording to warn others, on Friday afternoon. According to authorities the rupture of the dam in the Feijão mine, owned by Vale, occurred while hundreds of Vale employees were working at the company’s administrative center or finishing their lunch at Vale’s restaurant building, both located right below the dam. The river of mud quickly reached the administration building as well as sweeping up houses and buildings located in the community of Vila Ferteco. “This time it’s a human tragedy; we’re talking about a probably large number of victims, we do not know how many, but we know it’s going to be a big number,” Vale’s Chief Executive, Fábio Schvartsman told journalists on Friday afternoon at Rio de Janeiro’s international airport. The executive had just arrived from Davos, Switzerland, where he attended the World Economic Forum. The president of Vale states that the environmental damage will be smaller in comparison with the one occurred in the tragedy of Mariana in 2015, but that the number of deaths is likely to be much higher. “As the dam was inactive, the material was reasonably dry, and as a result, it has no power to travel long distances, the environmental part must be much smaller and the human part terrible,” said Schvartsman. According to Vale officials more than 300 employees were working at the location at the time of the accident. The latest official data registers ten people dead, one hundred have been rescued, several in critical condition and 345 missing, but officials admit that these numbers may rise since they do not have a conclusive number on the people who lived in the area. 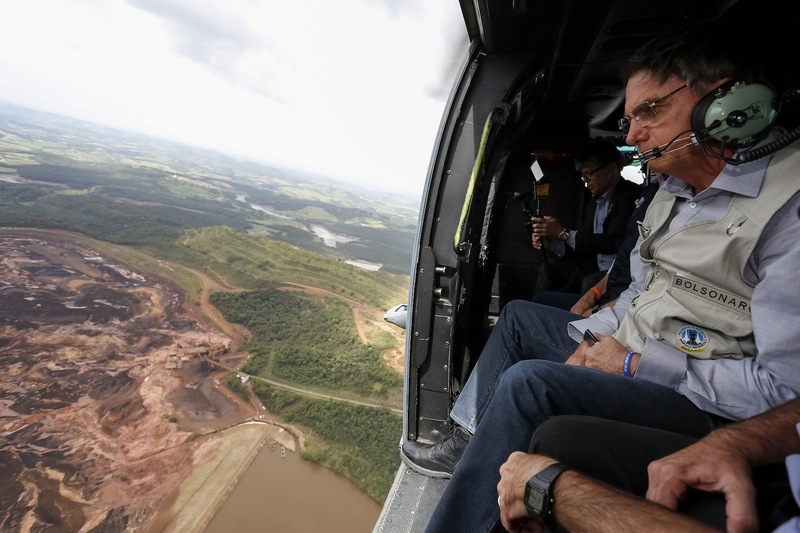 President Jair Bolsonaro surveys the area affected by the dam burst in Brumadinho, photo by Isac Nobrega/PR. On Saturday morning fireman say they found a bus under the mud with several bodies. Officials were unable to say if it was a city bus or a Vale company bus transporting workers. Brazil’s President, Jair Bolsonaro, surveyed the area by helicopter on Saturday morning. After rescuers worked all night looking for survivors, the governor of Minas Gerais, Romeu Zema, said Saturday morning that he remains hopeful in finding survivors. “Let’s do what is possible, and impossible as well,” he said, through his Twitter profile. The tragedy of Mariana (MG), occurred in November 2015, when the Samarco dam, owned by Vale and BHP Billiton, burst, spilling thousands of tons of toxic mud into the countryside and into the Rio Doce River. At the time, nineteen people died and hundreds were displaced as a result. The Samarco incident contaminated the entire Rio Doce River, with the mud traveling across the state of Minas Gerais, into the state of Espirito Santo and spilling into the Atlantic Ocean. The Mariana dam burst is considered the greatest environmental tragedy of the country, causing millions of dollars worth of damage to the environment and the livelihood of those who lived along the river and fished and planted for their survival.